November, 1927 Vermont LS 00172_000 (Main St during the flood, Richford, VT) LS 00172_001 (Present day Main St, Richford, VT) October, 1927 rainfall for the state of Vermont was already 50% above normal. 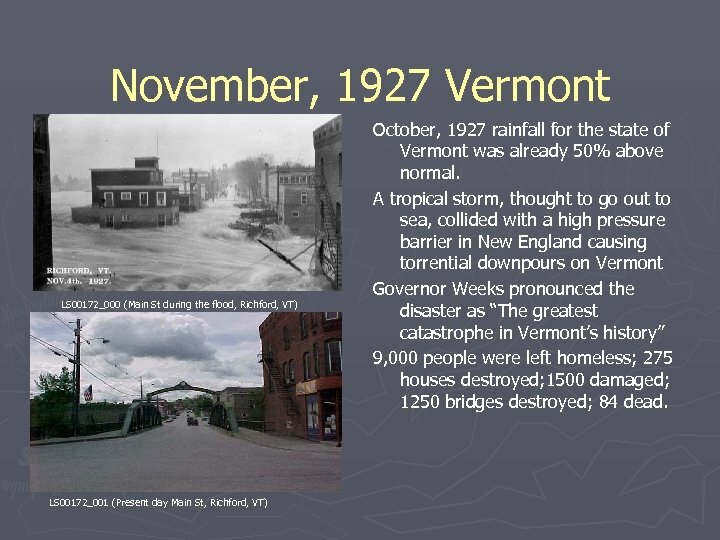 A tropical storm, thought to go out to sea, collided with a high pressure barrier in New England causing torrential downpours on Vermont Governor Weeks pronounced the disaster as “The greatest catastrophe in Vermont’s history” 9, 000 people were left homeless; 275 houses destroyed; 1500 damaged; 1250 bridges destroyed; 84 dead. 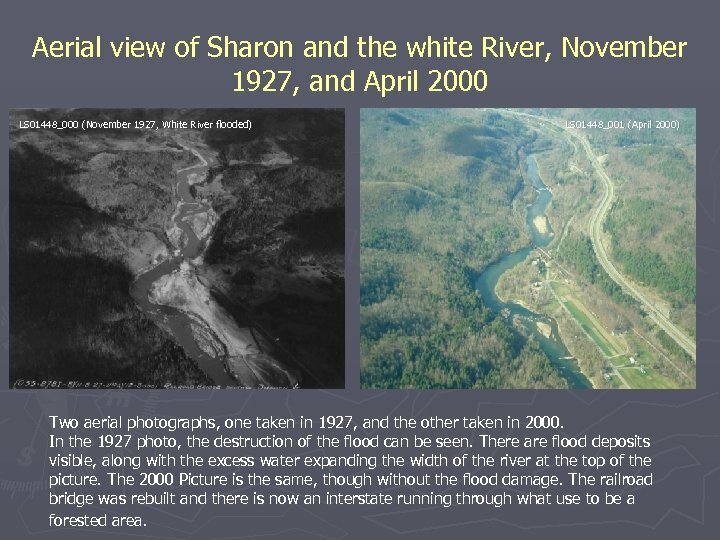 Aerial view of Sharon and the white River, November 1927, and April 2000 LS 01448_000 (November 1927, White River flooded) LS 01448_001 (April 2000) Two aerial photographs, one taken in 1927, and the other taken in 2000. 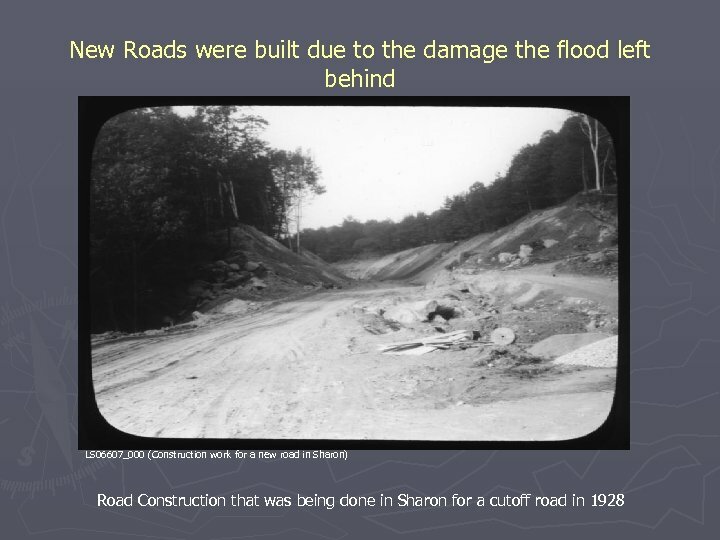 In the 1927 photo, the destruction of the flood can be seen. 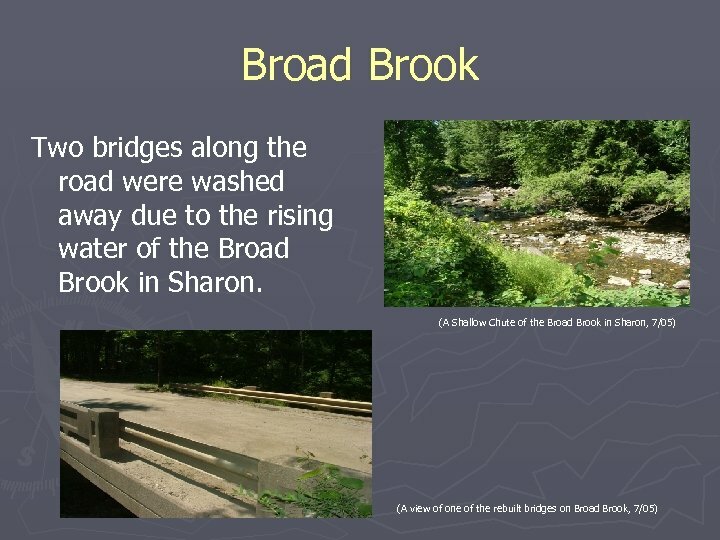 There are flood deposits visible, along with the excess water expanding the width of the river at the top of the picture. The 2000 Picture is the same, though without the flood damage. The railroad bridge was rebuilt and there is now an interstate running through what use to be a forested area. What happened to Sharon? 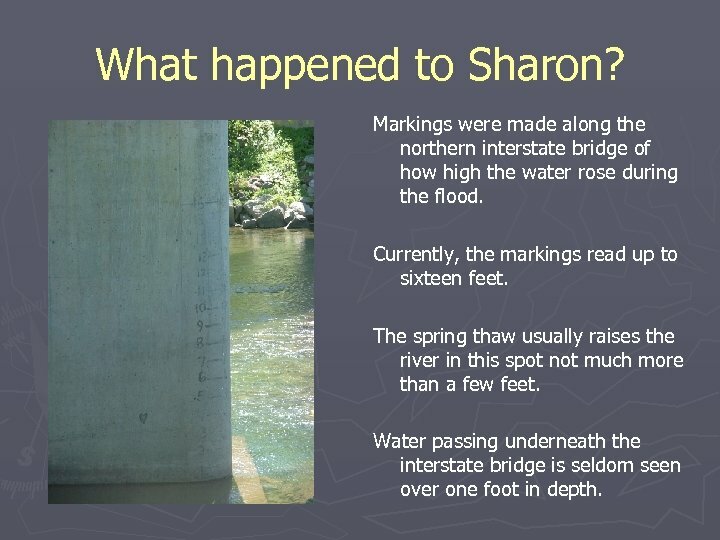 Markings were made along the northern interstate bridge of how high the water rose during the flood. Currently, the markings read up to sixteen feet. The spring thaw usually raises the river in this spot not much more than a few feet. Water passing underneath the interstate bridge is seldom seen over one foot in depth. 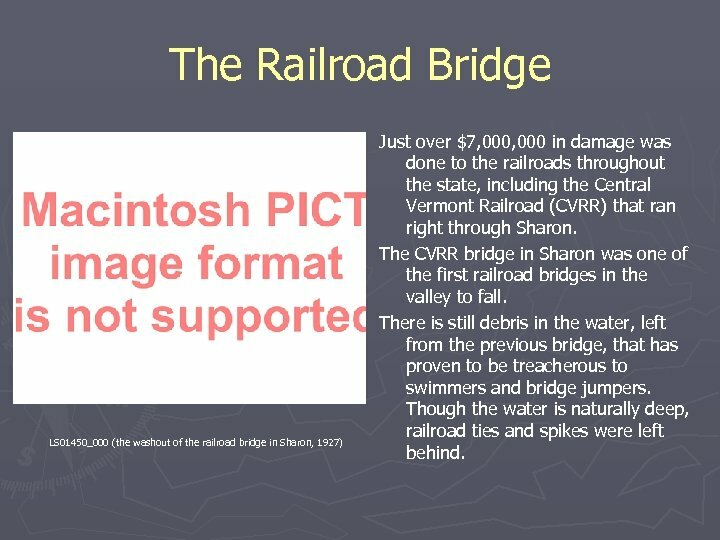 The Railroad Bridge LS 01450_000 (the washout of the railroad bridge in Sharon, 1927) Just over $7, 000 in damage was done to the railroads throughout the state, including the Central Vermont Railroad (CVRR) that ran right through Sharon. 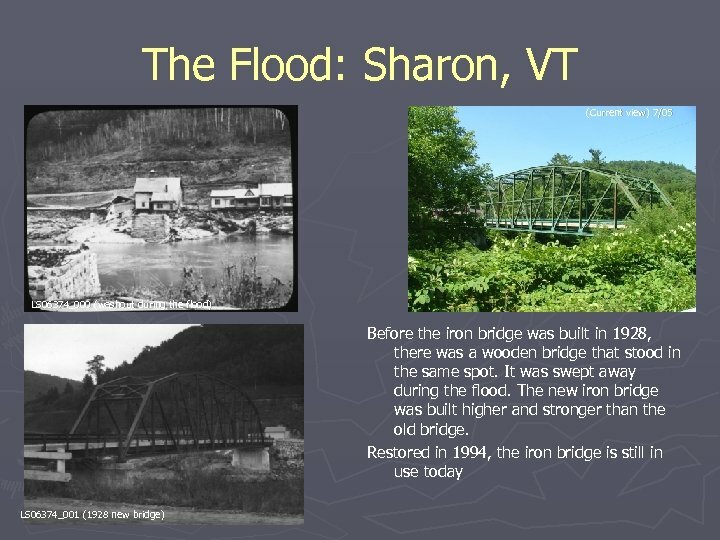 The CVRR bridge in Sharon was one of the first railroad bridges in the valley to fall. There is still debris in the water, left from the previous bridge, that has proven to be treacherous to swimmers and bridge jumpers. Though the water is naturally deep, railroad ties and spikes were left behind. 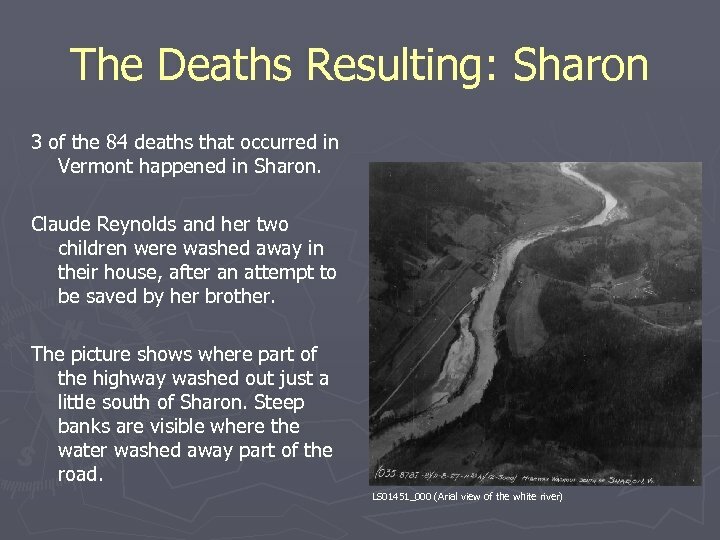 The Sharon Dam Pictures taken 7/05, The Sharon Dam It was the rush of water from the fall of the dam that took the lives of the Reynolds family. 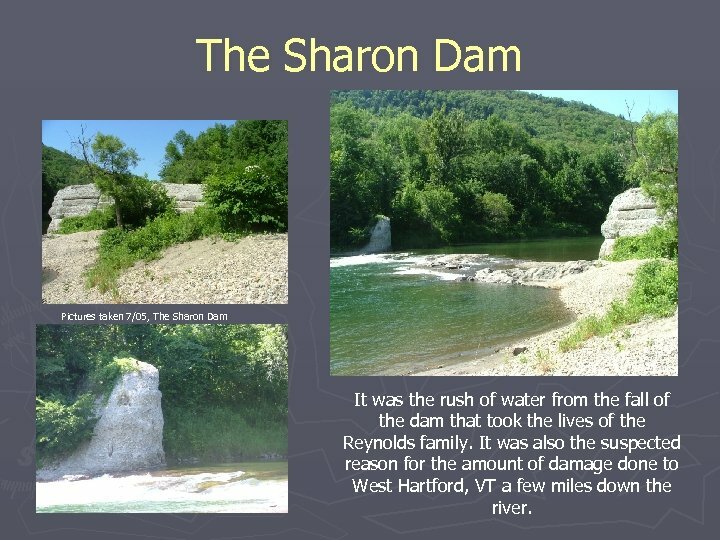 It was also the suspected reason for the amount of damage done to West Hartford, VT a few miles down the river. 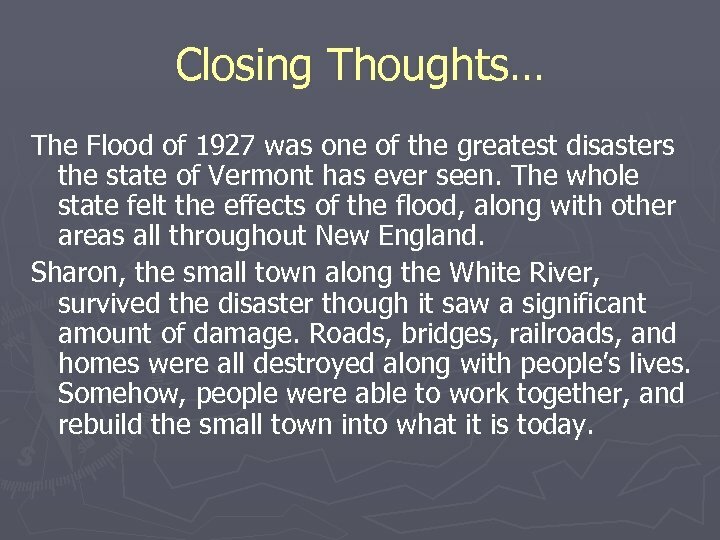 Closing Thoughts… The Flood of 1927 was one of the greatest disasters the state of Vermont has ever seen. The whole state felt the effects of the flood, along with other areas all throughout New England. 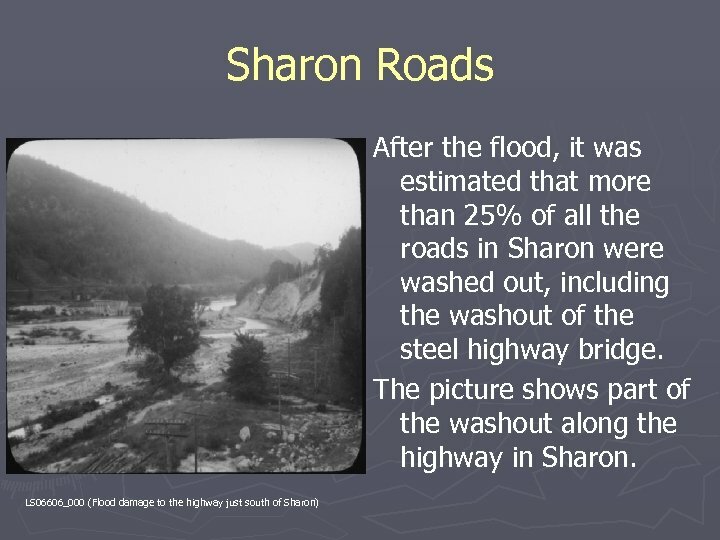 Sharon, the small town along the White River, survived the disaster though it saw a significant amount of damage. Roads, bridges, railroads, and homes were all destroyed along with people’s lives. Somehow, people were able to work together, and rebuild the small town into what it is today. 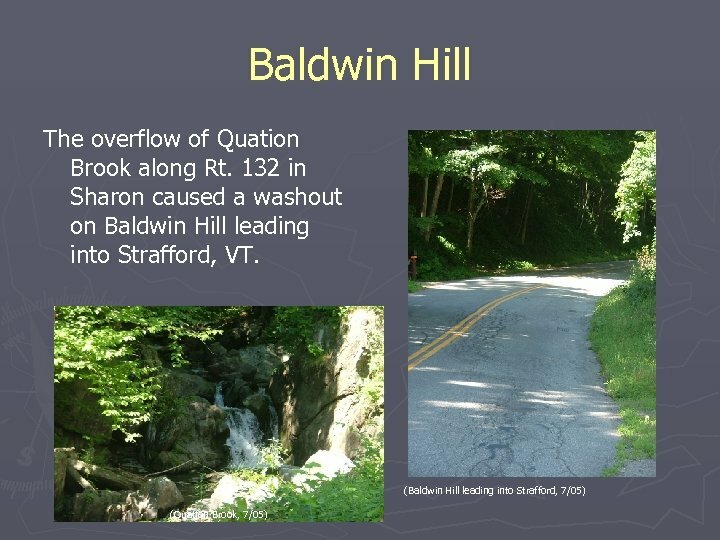 References Atwood, R. E. (1927) Stories and Pictures of the Vermont Flood Belding, P. W. (1996) Through Hell and High Water in Barre Vermont Fava et al, Bailey, V. C. (November 2002) 75 th Anniversary November 3 -4 1927 Flood Waterbury Historical Society Johnson, L. B. 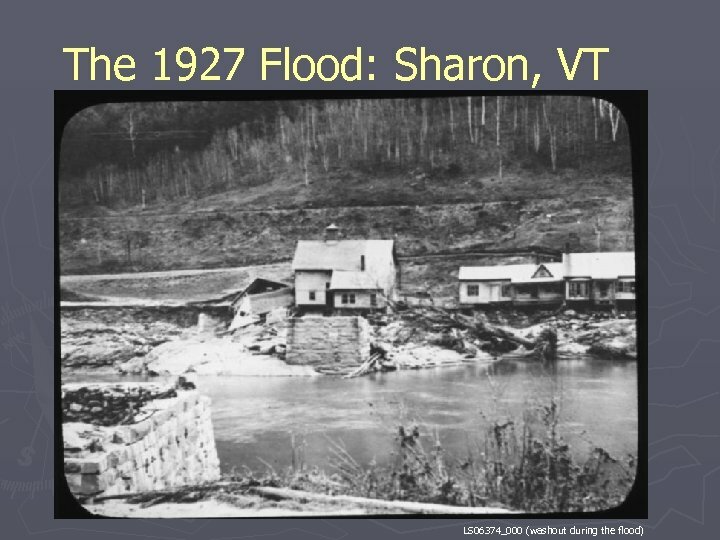 (1996) The ’ 27 Flood: An Authentic Account of Vermonts Greatest Disasters. Greenhill Books. 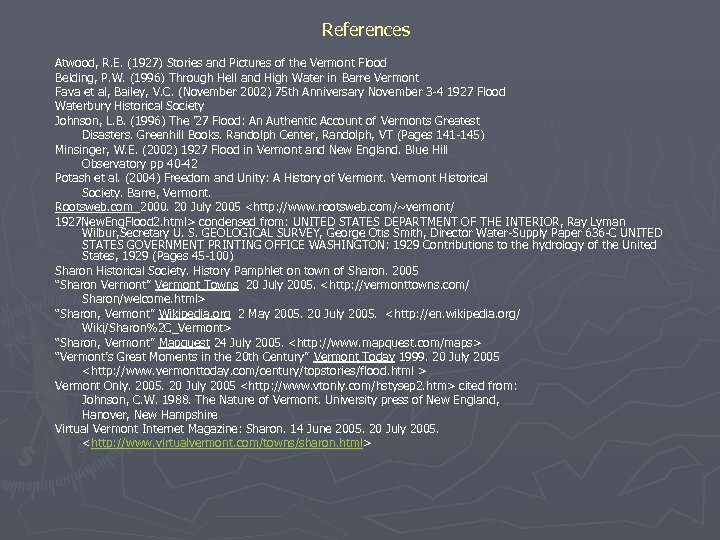 Randolph Center, Randolph, VT (Pages 141 -145) Minsinger, W. E. (2002) 1927 Flood in Vermont and New England. Blue Hill Observatory pp 40 -42 Potash et al. (2004) Freedom and Unity: A History of Vermont Historical Society. Barre, Vermont. Rootsweb. com 2000. 20 July 2005 condensed from: UNITED STATES DEPARTMENT OF THE INTERIOR, Ray Lyman Wilbur, Secretary U. S. GEOLOGICAL SURVEY, George Otis Smith, Director Water-Supply Paper 636 -C UNITED STATES GOVERNMENT PRINTING OFFICE WASHINGTON: 1929 Contributions to the hydrology of the United States, 1929 (Pages 45 -100) Sharon Historical Society. History Pamphlet on town of Sharon. 2005 “Sharon Vermont” Vermont Towns 20 July 2005. 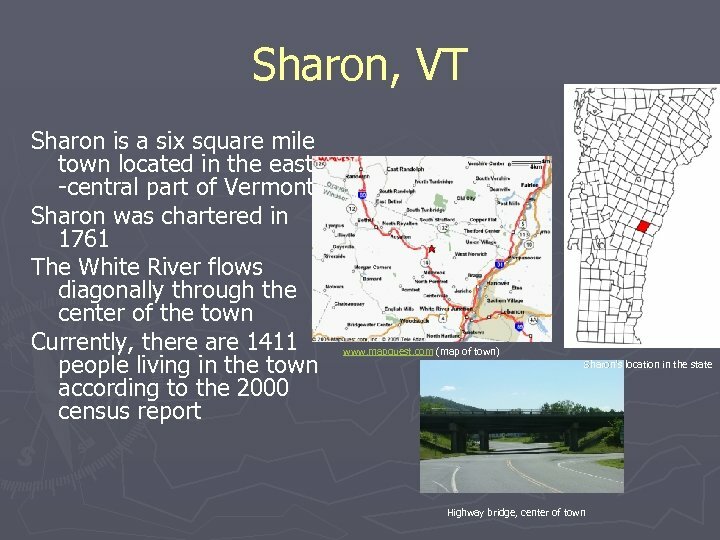 “Sharon, Vermont” Wikipedia. org 2 May 2005. 20 July 2005. 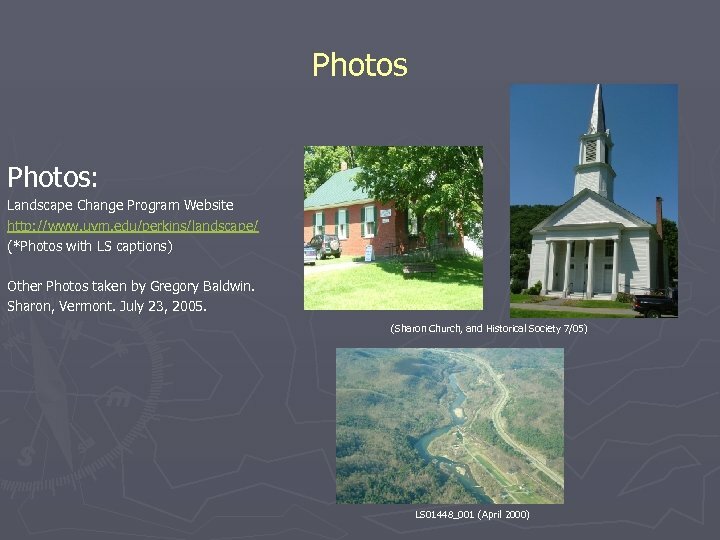 “Sharon, Vermont” Mapquest 24 July 2005. “Vermont’s Great Moments in the 20 th Century” Vermont Today 1999. 20 July 2005 Vermont Only. 2005. 20 July 2005 cited from: Johnson, C. W. 1988. The Nature of Vermont. 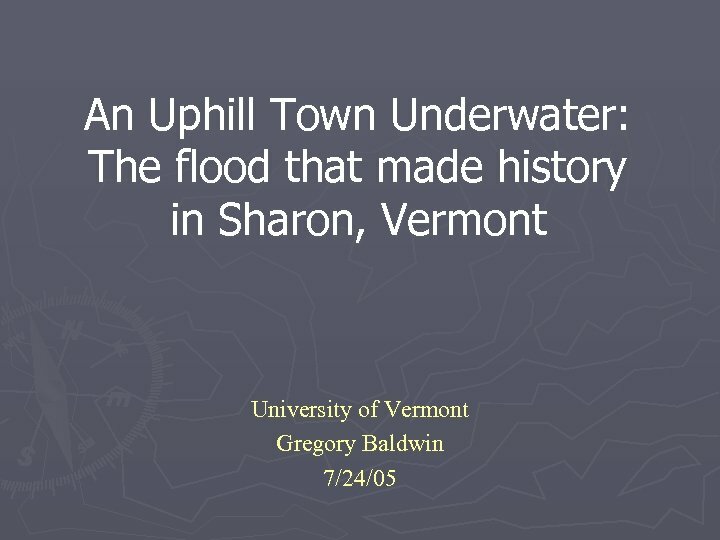 University press of New England, Hanover, New Hampshire Virtual Vermont Internet Magazine: Sharon. 14 June 2005. 20 July 2005.